It is a new version of the language HTML, with new elements, attributes, and behaviors,and a larger set of technologies that allows more diverse and powerful Web sites and applications. This set is sometimes called HTML5 & friends and often shortened to just HTML5. Semantics : Allowing you to describe more precisely what your content is. Offline & Storage : Allowing webpages to store data on the client-side locally and operate offline more efficiently. Multimedia : Making video and audio first-class citizens in the Open Web. 2D/3D Graphics & Effects : Allowing a much more divisive range of presentation options. Performance & Integration : Providing greater speed optimization and better usage of computer hardware. Device Access : Allowing for the usage of various input and output devices. Styling : Letting authors write more sophisticated themes. 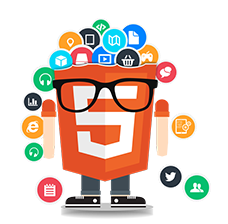 The new HTML 5 has surpassed the expectations of developers in all aspects and has allowed fulfilling customersï¿½ requirement with ease. Better integration of multimedia and advanced graphics with new syntactical features. No use of flash and other media plug-ins, saving precious power in mobile devices. We ensure version compatibility of iOS. Provides better temporary storage for users. Lesser page loading time for users.